The 1st of October proved to be a memorable day and even more of a memorable night. Why was it so significant? Well, it marked the day where Cat Parfitt and Bence Szentklaray took over Tekstreme Diving. 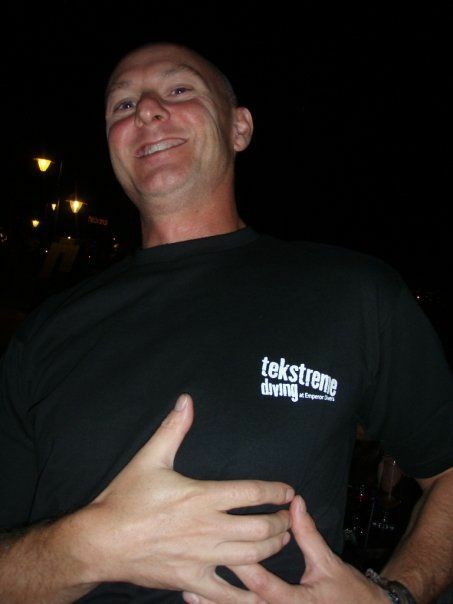 What began as just an idea to have a few celebratory drinks together turned into a much larger Tekstreme party night! The “Friends Bar”, a recent addition to the new marina in Hurghada, was decked out Techy style with tanks, equipment and helium balloons inviting everybody in. Even the drinks took on the theme with specialized Tekstreme cocktails and shots. Cat says, “It was a great pleasure to see our guests, all of our friends and colleagues from many businesses in the local Hurghada area coming to support our new adventure. We are very grateful to everybody for all of your help and support”. To see for yourself the party night, check out the latest photo additions on the Tekstreme Facebook Group. No matter what your sport, equipment and technology advances in leaps and bounds enabling participants to continually push back the boundaries which previously held them in check. The world of scuba diving is certainly no stranger to improving technology and better safety standards, particularly in the field of technical diving. With divers being able to explore further and find ‘new’ sites and wrecks, there is obviously a need for more dive destinations to accommodate these ‘tekkies’. There are now more and more technical divers, many of whom are seeing the advantages of combining their sport with a holiday to foreign climes. The thought of being guaranteed 20 metres visibility at a depth of 100m without the need for a torch, followed by the long decompression phase of the dive being carried out on stunning coral reefs is enticing more and more technical divers overseas. The Egyptian Red Sea is already one of the top dive destinations in the world, so why not for the technical divers as well? The Red Sea resorts of Sharm el Sheikh and Dahab on the Sinai peninsular will probably already be known to a majority of deeper divers, with famous sites such as the Blue Hole, and the canyon at Thomas Reef in the Straits of Tiran. However, what about the larger area of Hurghada on the mainland part of Egypt? Always known for its shallow coral gardens, and the wrecks at Abu Nuhas reef, what does it have to offer those divers who want to explore a bit deeper and get away from the recreational divers? In addition to the multitude of shallower sites, Hurghada has a number of wall dives for those people who wish to go beyond the normal recreational limits. The main thing to be careful of on any reef dive before jumping into the abyss is that the reef life you want to see does actually continue down to the depth at which you are planning the bottom phase of your dive. A number of beautiful reefs in many destinations turn into sandy slopes or dead, rocky walls beyond about 45m, so be sure to get an experienced trimix dive guide to explain the topography at depth. Unless you are on a training dive, or just ‘trying to get numbers on your dive computer’ you stand to waste a lot of money on a meaningless deep dive. On Small Giftun Island is the well-known dive called ‘Giftun Drift’. This is where technical diving pioneer Rob Palmer made his last dive, failing to return from the depths. It is a stunning wall with a small plateau from 16-25m, before dropping down to about 60m. The corals here extend right down to the bottom where they then continue down the steep slope to the ‘black canyon’ which drops off to over 200m. Massive gardens of gorgonian fans exist from the main wall at 30m down to about 60m in places, while huge great purple soft corals and smaller green soft corals are also prolific here between the depths of 60-85m. Quite often, larger fish will be hanging down here in the corals, keeping out the way of the divers up at the top of the wall. Big coral grouper, black-spotted stingrays nearly 2 metres across and big sharks are not uncommon sightings in the depths at this site. Just opposite the corner of the main reef down the wall at a depth of 40-45m is a picturesque archway in a part of the reef which sticks out into the water. Swimming thorough this arch is a pleasant way to complete the deeper stops as you come back up the wall, with small red fan corals adorning the walls on both sides. Just north of Giftun Drift is another site called Erg Somaya which, again, has beautiful corals on the wall right down to 55 metres. It is here, though that the wall becomes a sandy slope heading deeper, so this is a site really only suitable for deep air dives. In addition to the corals the wall is also riddled with various caves & overhangs from 27 metres down to the sandy bottom. Erg Somaya is often dived from the two mooring lines which exist here, giving the technical diver chance to decompress in comfort on the small plateau and around the two large pinnacles next to the lines. Three hours south of Hurghada by boat begins the diving area of Safaga, probably best known for the wreck of the Salem Express. However, some truly amazing wall dives exist here for the technical diver who wishes to have a break from staring at rusty metal! Panorama reef is a large circular reef with vertical, coral encrusted walls dropping into the deep. It is here that in 2003 three divers conducted what was then the deepest ever open water dive on closed circuit rebreathers. Grey reef sharks are regular visitors to the deeper parts of this reef, while large soft corals and gorgonian fans harbour the smaller marine life. Abu Kefan is another wall dive worth going a bit deeper on, but the currents here can sometimes prove to be too much for a safe technical dive to be undertaken here. The majority of technical divers, especially the Brits, prefer diving on wrecks, and Hurghada has more of these to offer than either Sharm el Sheikh or Dahab. The newest wreck in the area is Egypt’s first ever artificial wreck reef which was purposely sunk to provide a new dive site in the area and to try to alleviate pressure on some of the existing sites in the area. Following cooperation between the Red Sea Association and the Egyptian Navy, a ship was bought, towed out, and then sunk, but accidentally in the wrong place! Rather than sinking it in 30 metres to provide a site for all levels of divers unforeseen circumstances resulted in the vessel ending up on the sea bed at 46 metres – great shallow dive for tekkies!! The ship, Hebat Allah, had been sitting on the main reef outside the port of Hurghada for a number of years after breaking its moorings and drifting there in rough seas. A 51 metre long, 300 ton freighter with a beam of 8 metres, it was small enough to be re-floated off the reef and then sunk again. It now rests between the sites of Giftun Island and Gota Abu Ramada on a level seabed. Being completely intact and upright, it makes for a great dive, and with the interior of the wreck being roped, complete with exit arrows, before it’s sinking, it is perfect for a safe penetration and for training dives. The top of the stern mast goes up to 27 metres, with the main bridge at 36 metres, and the deck level lying at 40 metres. 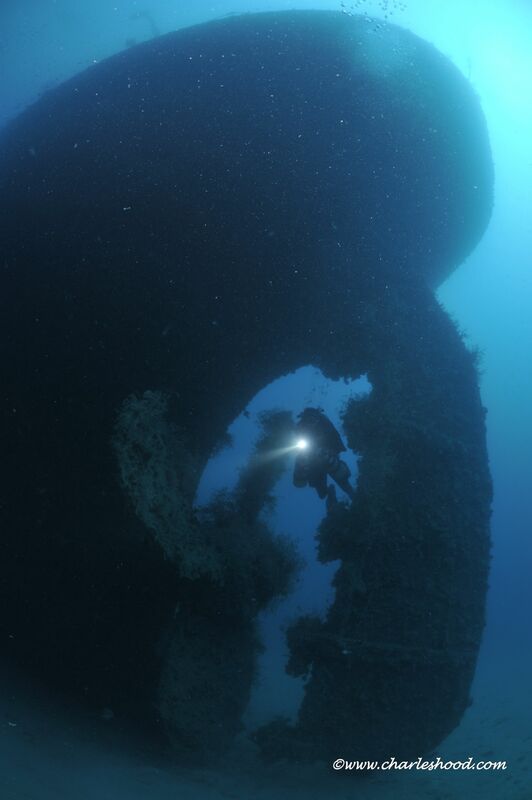 With a maximum depth of 46 metres by the propeller, this wreck is perfect for those technical divers who have not yet got the experience to progress to deeper sites, and is an ideal site to test new kit or practice skills and drills on. After just over six months on the seabed the wreck is already teeming with life – shoals of fusiliers can be found over the stern section, while large hard corals have already grow on the railings. This is an ecosystem in the making and will only get better! The reef of Shaabruhr Umm Gamar to the north of Hurghada is home to at least three wrecks. With the patrol boat wreck at the south tip, familiar to daily divers, being little more than an engine block and some metal, only two of these wrecks are of any real interest to deeper divers. The wreck of the liveaboard vessel Colona IV lies at the base of the eastern reef wall about half way along the reef. It hit the north of the reef and then drifted before coming to rest at a depth of 65 metres on its starboard side. Being a liveaboard boat, it is not overly large and is therefore easily explored in the short bottom time offered by these dives. Following this, the diver can gently ascend back up the reef wall taking in the multitude of coral life – much of it endemic to the area, while drifting back to the boats moored up at the south tip. Currently the deepest dived wreck in the Hurghada area is that of the Gulf Fleet cable laying vessel which is just at the north-east tip of Shaabruhr Umm Gamar. Little is known about when or how this 60 metre long vessel came to be here, but it lies upright and intact at a maximum depth of 108 metres, making it a dive only for experienced trimix divers. Being at the base of the reef wall it is easy to descend down on to and then the first destination is usually to swim under the hull at 105 metres where the ship came to rest up against a large rocky outcrop. Coming up on to bridge area at 95 metres it is then possible to conduct some penetration here, although obviously not forgetting the depth you are at! Once you have finished exploring the main superstructure, you can then swim back up the large, flat deck area to the foredeck cranes at the shallowest point of 86 metres on the wreck. It is here that large shoals of sweeper and fusiliers can be found amongst the huge soft corals which have taken up residence on these prominent features. Once you have all-too-quickly run out of bottom time, it is easy to simply follow the reef wall back up to begin decompressing at leisure. If the current is helping you along, it is often possible to see the wreck of Colona IV at your deeper stops before coming back up to south plateau where the boat will have a deco trapeze waiting for you. Or you could just hang around on the reef and look at all the fishes! Just north of Hurghada at the Island of Gobal lies a wreck which is already becoming a very popular dive site for the safari boats. The Rosalie Moller was casualty of the second world war, and whose fate ties in very closely with that of the world famous Thistlegorm. Two days after the sinking of the Thistlegorm, with the Germans realising they had just discovered the main anchorage sites for the allied shipping heading up the Red Sea, a series of bombing raids were launched over the Gulf of Suez. On the morning of October 8th, 1941, the 112 meter long coal-carrying Rosalie Moller was hit by one of the bombs dropped by a Heinkel as it attacked the area. Two of the crew were killed by the explosion which cracked the starboard side of the hull aft of the bridge, and the ship went straight down, kept upright by the weight of the water-logged cargo. It now rests at a maximum depth of 48 metres on the seabed, with the decks at 36 metres and the two masts rising up to 18 metres. While recreational divers visit the site on single 12 litre tanks, the safest and by far the most rewarding way to dive the Rosalie Moller is to make a full technical dive out of it. This gives you plenty of time on the wreck to explore and appreciate its attractions, while giving you the safety of redundancy and bailout options should something happen. The marine life is simply amazing on the Rosalie Moller, with the sheer density of the shoals of glassfish making it difficult to see the wreck in places. Huge lionfish and grouper can be found hanging around the decks and there are some beautiful soft corals and anemones adorning some of the structures. This wreck can be visited from Hurghada, or on a mini or full safari heading north. So Hurghada is a great dive destination not only for recreational divers, but also for all those technical divers who want to get away from the UK for a few dives. Alternatively it’s handy if you want to earn a few extra brownie points by taking your other halves for a nice sun-bathing holiday while you sneak off into the deep! With several dive centres in Hurghada now having full technical diving facilities for both open circuit and CCR divers, it’s possible to go out there knowing you’ll be able to dive to the full extent of your experience and qualifications. Also for those recreational divers who wish to ‘extend the range’ of their diving, all technical dive courses are on offer from advanced nitrox right up to mixed gas closed circuit rebreather instructor. It should also be noted that with the main office of TDI (Technical Diving International) Middle East and Russia being located in the main tourist area of Hurghada, all the TDI materials and various diving ‘gadgets’ and kit are easily available to divers coming from abroad. Paul Vinten has been working in the Red Sea since 1998, both in Sharm & Hurghada. 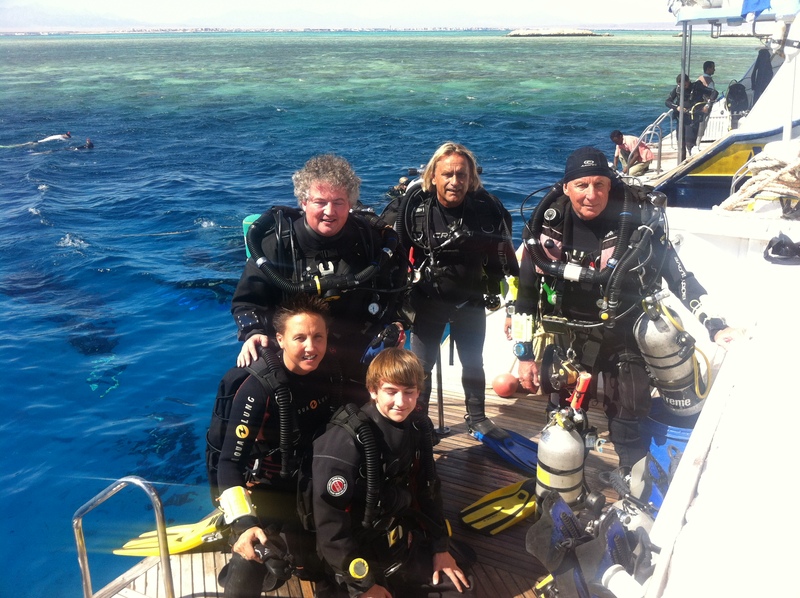 After spending nearly six years on safari boats, he is now the manager of Tekstreme Diving in Hurghada, being their in-house TDI Instructor Trainer.